"Plot generators to maximum, chief!" The GameMaster's Apprentice: Sci Fi is a system-neutral deck of cards that can be used as either a supplement for traditional tabletop RPGs or as a complete game engine for GM-free solo or group RPGs. 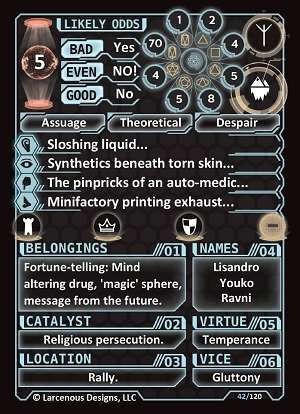 This variant deck is aimed at science fiction of every kind, from shiny space operas to the grim, dark streets of a megacorp-dominated Earth. If you want specifics, including examples of how to use the randomizers on the cards, the complete instructions are available in the downloadable PDF preview linked below the cover image/thumbnail, but you can take a look at the overview below to see the quick and dirty version of what is on each card, and you can view a video preview using the base deck from the original Kickstarter that explains how to use the cards to run a GM-free game or generate a story for a traditional RPG. This video is the second in a series, so if you want to see the first (which details initial generation of the story), check out our website, www.LarcenousDesigns.com! If i print the PDF myself as a 'double sided' print job will the fronts and backs line up so i can just laminate a sheet and cut out the cards? Thanks. In an ideal world, but I’ve never been so lucky! I have found that they tend to be slightly offset. To help, the card images on the PnP files include the full bleed area, which means you may be able to just cut them down a little and lose the visible offset by trimming carefully. However, since your individual printer and luck are involved, I would start with two pages back to back and check the fit before printing the rest. If that doesn’t work out, my usual method is to print them single-sided on normal paper, and then put two cards back to back inside transparent card sleeves. Good luck! Please let me know if you have any more questions or issues, either here or by emailing me at Larcenousdesigns@gmail.com. I notice the cards were updated recently. What is the nature of the update? Do I have to pen in any errata on the physical cards themselves? No errata needed--I was just adding the Adventure Guide to the downloads. It should appear as a new file, titled something like "GMA AG SciFi.pdf"
When I checked for any Updates in my Library, it gave 4 files in the list. So you say it is only the addition of an Adventure Guide? Good. That is correct--the other three are all still the same as when they were first uploaded (they weren't all uploaded at the same time, but none of them have changed), and the print-on-demand copy is still the same! I just always meant to add the Adventure Guide, but wanted to get all of them done first, and so delayed until now...apologies for causing concern! These decks are absolutely great! I love them. I have the 3 available now and will definitely be picking up the others when they come out. Beautiful concept! When I get home and get my credit-card I'm ordering! Much appreciated for SF gaming. Thanks! I hope they serve you well--I'm using them to run a Numenera game, and the fit is strangely perfect, since that setting basically allows any sub-genre of scifi to be equally valid for inspiration.